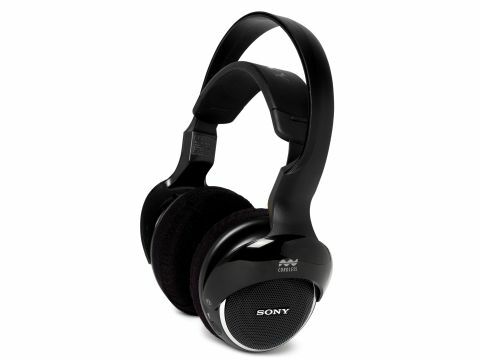 Sony's MDR-DS3000s are a wireless pair of cans, but they use infrared instead of RF signals. The theoretical upside is that there's less chance of interference from other devices around the home, but the downside is that they have a limited range of just 7m, which means you can't travel too far away from the base station. At £200, you'd expect build quality to be good and it doesn't disappoint. The self-adjusting headband automatically activates playback when the cans are placed on the head, which is a nice touch. Removing them automatically turns them off and saves on battery life. Speaking of which, the rechargeables last around 15hrs, and are automatically recharged in situ at the base station. What's more, you can use alkaline batteries in place of the rechargeables, giving around 35hrs of playback. A digital optical connection takes 5.1 surround soundtracks and Sony's Virtual Phone Technology coverts them to a surround sound-like experience. Performance is good and movies have full and rich character, filling your head with an expansive soundstage that's pretty close to the real thing. Bass levels are good, and the headphones are extremely comfortable to wear, thanks to the lightweight headset and the plush foam ear-pads. In fact, if it wasn't for the mildly annoying background hiss throughout we'd say that it's easy to forget you're wearing the Sony cans, but unfortunately the hiss is too much of a distraction.